“Automark Technologies (India) Pvt. 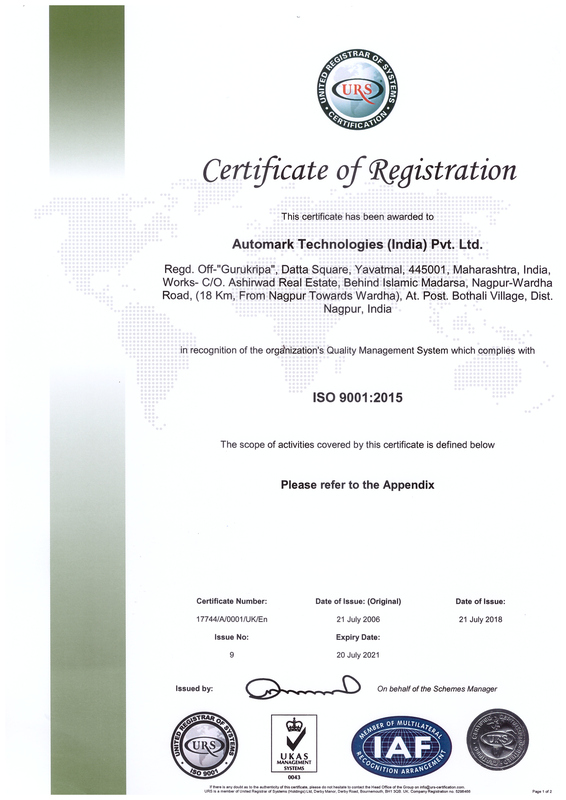 Ltd.,” got ISO (9001:2015) certified . All our products are manufactured under strict quality control parameters by our qualified team of professionals. Automark’s Quality Policy is in conjunction to the business plan and marketing strategy. Our focus and objective is to satisfy our customer’s needs. The quality policy is understood and followed at all levels and by all the employees of Automark. Each employee needs measurable objectives to work towards. At Automark, decisions about the quality system are made, based on recorded data, and the system is regularly audited and evaluated for conformance and effectiveness. The business needs to determine customer requirements and create systems for communicating with the customers about product information, inquiries, contracts, orders, feedback and complaints. When developing new products, we plan the stages of development, with appropriate testing at each stage. We test and document whether the product meets design requirements, regulatory requirements and user needs.